Why do you move so quickly? Only yesterday it was weeks until Christmas and today I wake up to find that there are only three more sleeps! Slow down loser. 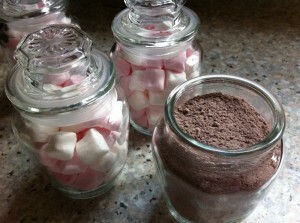 I saw this recipe for Hot Cocoa at My Baking Addiction (another find through Twitter. Loving that!) and thought that this would be a great way to use up some sweet little jars I bought, and it would make great Christmas gifts. 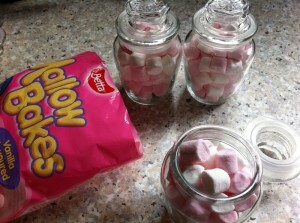 PLUS it meant that I could buy marshmallows, because who doesn’t have marshmallows all the time with their hot chocolate? I thought I would make it a little more christmassy by adding in some cinnamon and I reduced the amount that I made, but otherwise the recipe was great as it was. p.s. 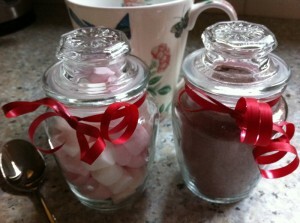 how cute are these jars? $2.5o from a little reject shop style store. Make sure that you wash them thoroughly in hot soapy water though. If you are totally stuck for ideas this Christmas, I would recommend this. Who doesn’t like hot chocolate? And why would you be friends with someone who doesn’t like hot chocolate? I’m pretty sure thats not normal. If you want to view the original recipe you can find it here. 1. 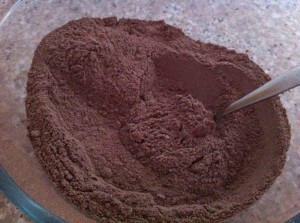 Mix all ingredients together and sift several times. The more times you sift, the finer your mix will be. You could add more or different spices according to what you like or what your giftee would like. Be creative! Coconut and Strawberry Cookies and an Exciting Announcement! 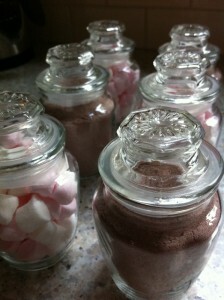 love hot chocolate, sure would be perfect with this crummy weather we’ve been having! hope you have a merry christmas!